This is a sugar free sweet, amazingly delicious. Crushed or chopped dry fruits and oats are sauteed in desi ghee, which give a nice and crunchy texture to the sweet, Make and enjoy ! 1. Heat ghee in a sauce pan and Reduce the flame. Fry all the dry fruits until they give out a nice aroma. Remove and set aside to cool. 2. In the same pan saute the oats in the remaining ghee. 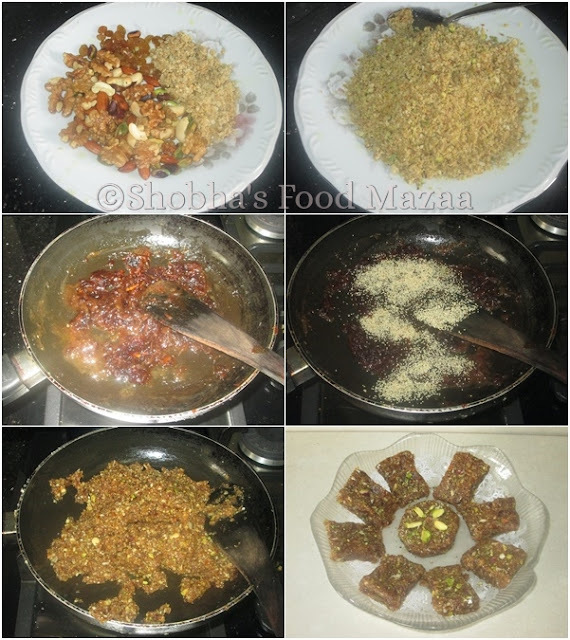 Remove them in the same pan with dry fruits. 3. Add very little ghee and fry the edible gum on very low flame. It will puff up. Remove it in a bowl. 4. Grind all the dry fruits coarsely in a dry grinder. 5. Now in the same pan saute the chopped seedless dates and keep stirring until they melt and form onto a lump.If they are fresh you will not need to sprinkle any water. If you think they are not becoming soft then sprinkle 2 tbsps of water and stir well until they soften. 6. Now add the ground dry fruits, fried edible gum and poppy seeds. 7. Keep stirring until they are mixed up well and form into a lump. 8. Brush a flat plate with a little ghee. 9. Remove the prepared sweet and flatten it with spatula. 10. Garnish with pistachio powder. Allow it to cool before cutting it. delicious and nutritious burfi di :) looks yumm .. 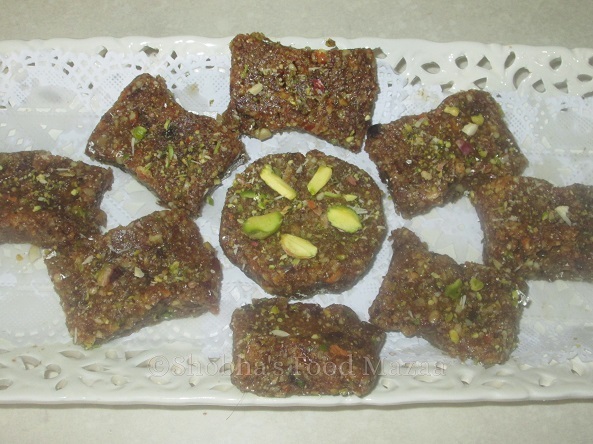 This oats barfi with dried fruits and nuts is quite healthy and looks delicious. Thanks Mayuri.. It tastes so good.. do make it sometime. 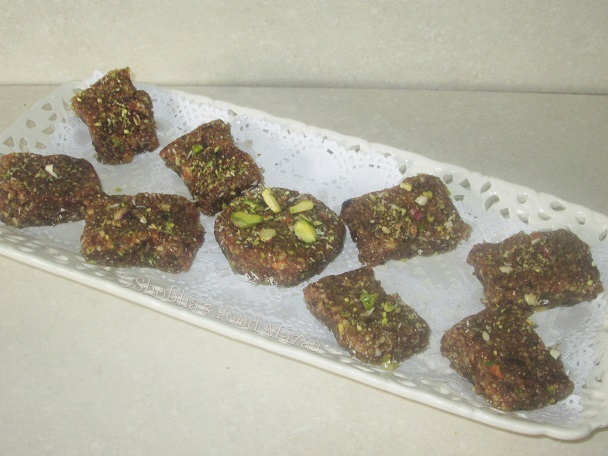 Barfi made with oats quite an unusual combination, but you have pulled it off so well. Sounds delicious.